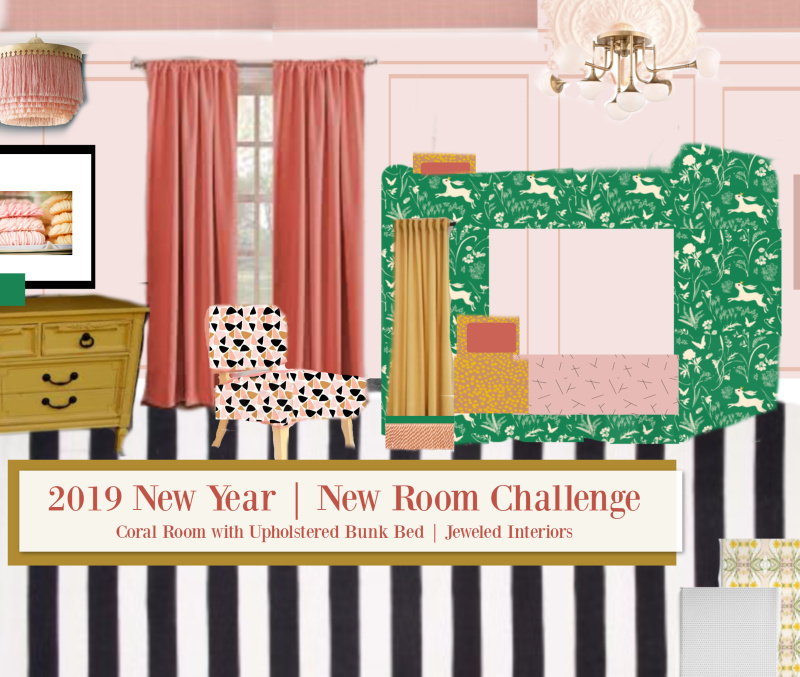 We are nearing the finish line in the New Year New Room Refresh Challenge hosted by Stephanie from Casa Watkins Living. This is the time in the challenge when the to do list is still so long, the nights become a little more sleepless, and the postal deliveries become incredibly more exciting. One of my favorite boxes delivered to my doorstep this week was a very large one labeled with those oh so exciting words…Hudson Valley Lighting. 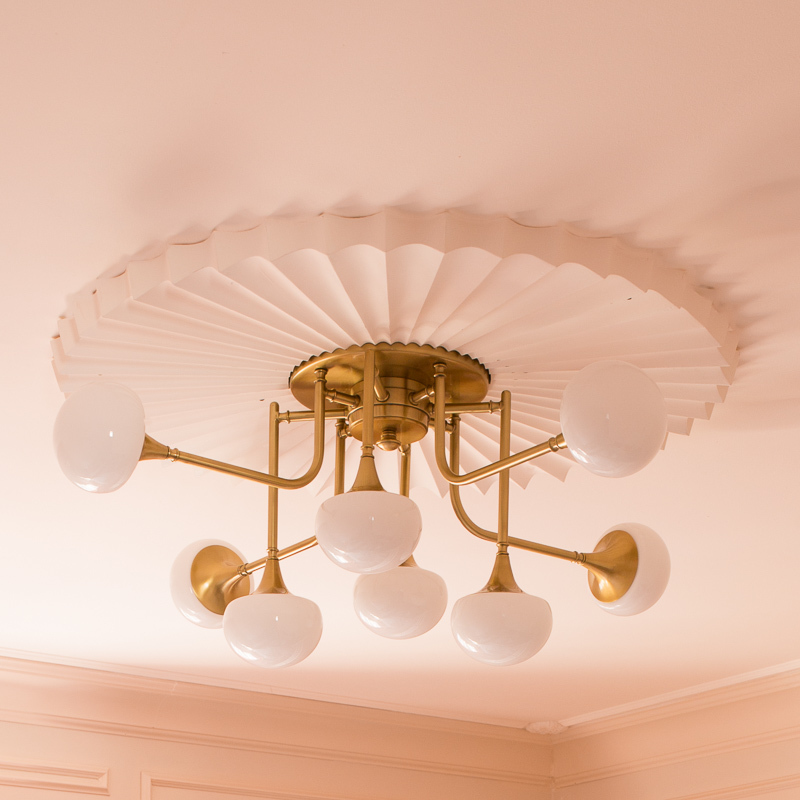 Check out what a difference our new Fleming Semi Flush Mount Art Deco chandelier has made in our girls’ room. You won’t even believe it. You may notice on the mood board above that we are going for a preppy play on a French Apartment (an eclectic mix of some French Providential, Art Deco, and even a dash of 1950’s glamour). What we started with, however, was far from glamorous. What do you think? 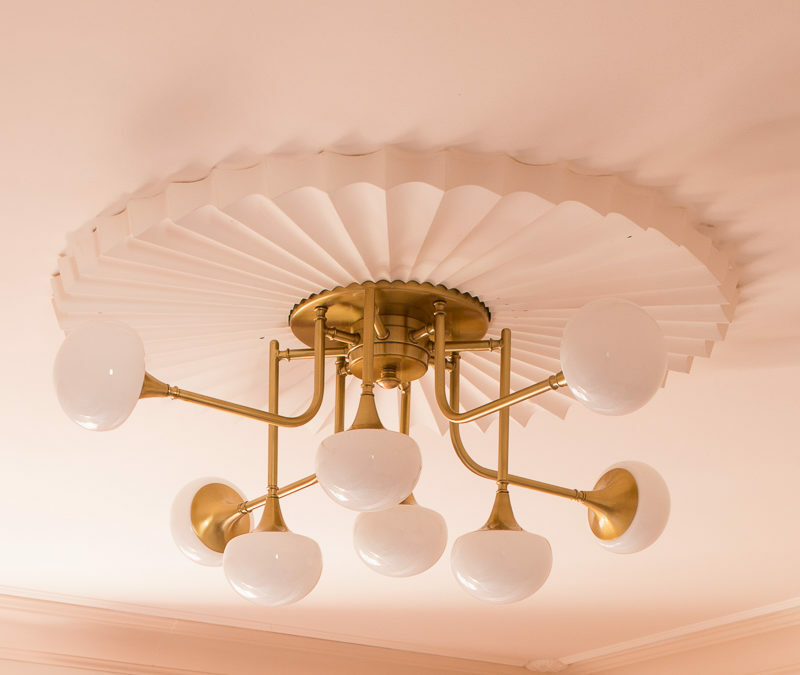 Isn’t that Hudson Valley Fleming Semi Flush Mount Art Deco Chandelier and the Architectural Depot Shakuras Ceiling Medallion combo about the coolest thing you ever did see? Based on the fact that it is a bunk bed space, I knew I wanted a semi flush mount. 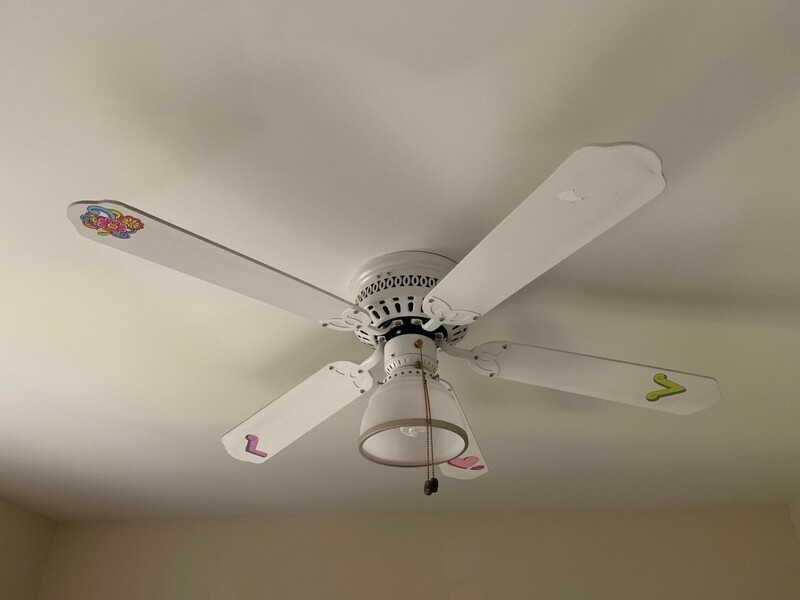 I don’t want my kids hanging from a chandelier, Tarzan style. When I was scrolling through Hudson Valley’s large selection I saw this beauty and just knew it was the winner. The scale is perfect. The lines are perfect. The amount of light emitted is, you guessed it, perfect. 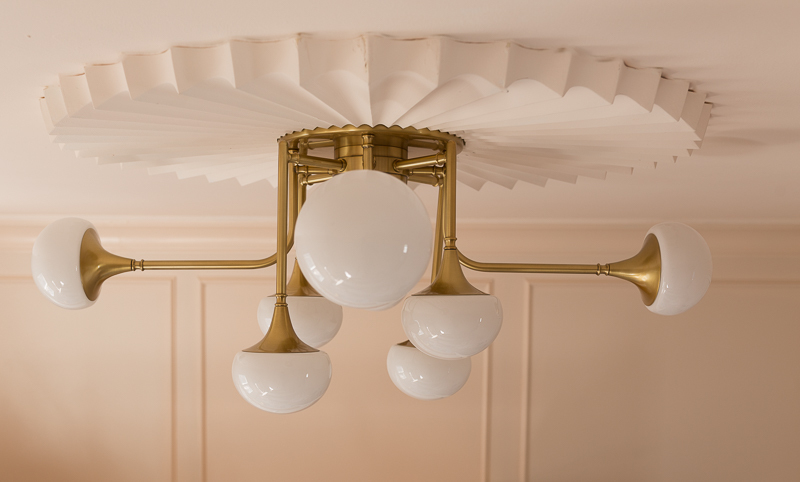 This light fixture would be an instant update for most any room, but especially here (considering the original fixture was a non functioning ceiling fan 😬). 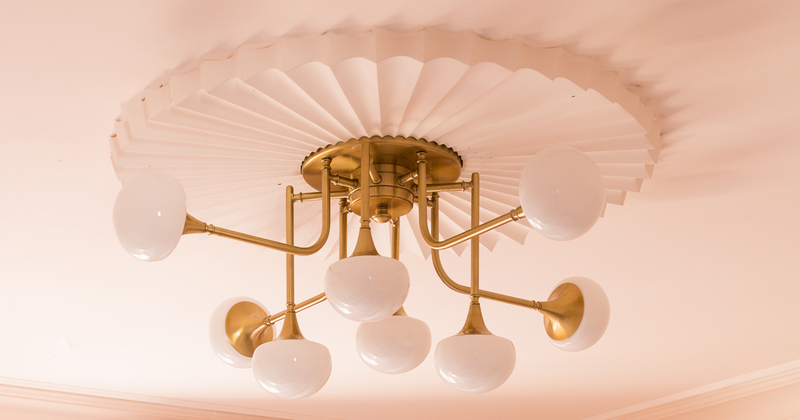 Oh Boy…I mean…really…If this isn’t what Art Deco chandelier dreams are made of, then I don’t know what is! 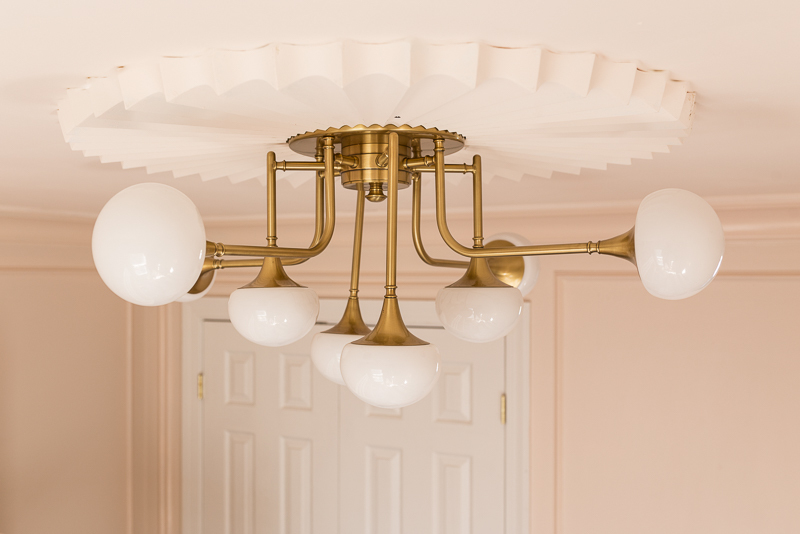 The Fleming Semi Flush Mount Art Deco Chandelier exceeded my expectations. The gold is a lovely color (not cheesy in the least bit), the construction is very solid, and the installation was simple (or at least that’s what my husband said :). I would definitely recommend this addition for anyone looking for a semi flush mount with a fresh, fun, Art Deco vibe. Architectural Depot is my go to for ceiling medallions. The Shakuras ended up being a perfect compliment to the chandelier. The funny thing is that I had originally planned to go with a more traditional medallion. Seeing it now, however, it’s hard to imagine any other ceiling medallion being quite so perfectly suited! Ok…We aren’t finished yet! There are big changes come to this space this week. 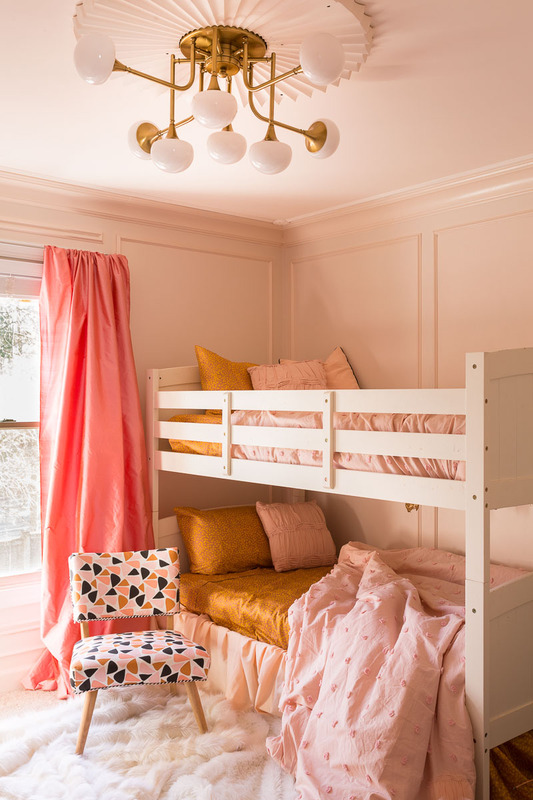 If you like the direction this is going, check back next Tuesday to see the upholstered bunk bed, painted furniture, new rug, art, and maybe new curtains….It’s going to be so good you guys! 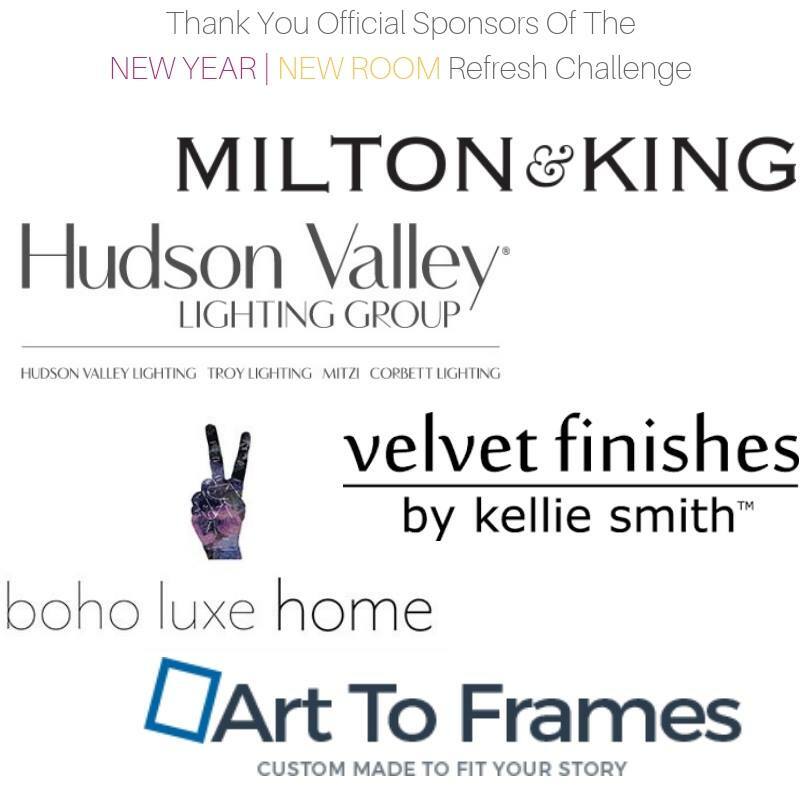 Thanks to all of our sponsors for supporting us in this event! 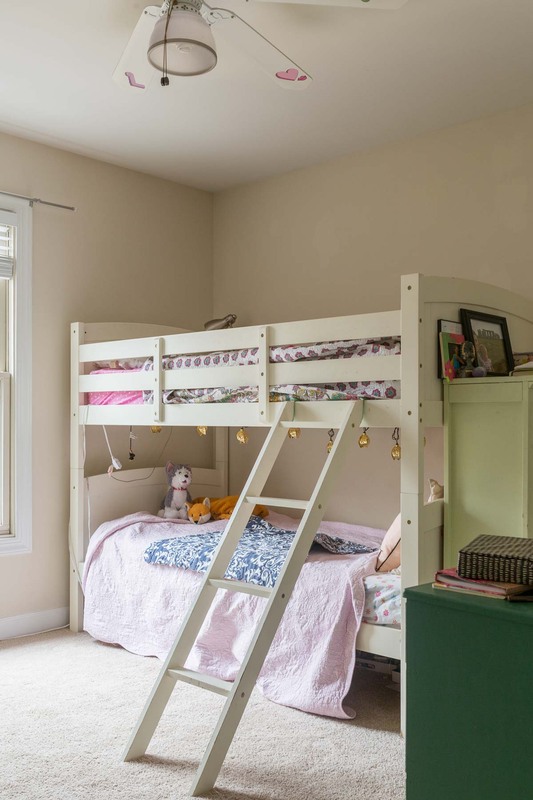 It’s so much fun to pull these rooms together, especially when its for two of our children. Dang. It’s gorgeous.😍 I have loved watching it all come together on insta stories. Looking fabulous, Jewel! 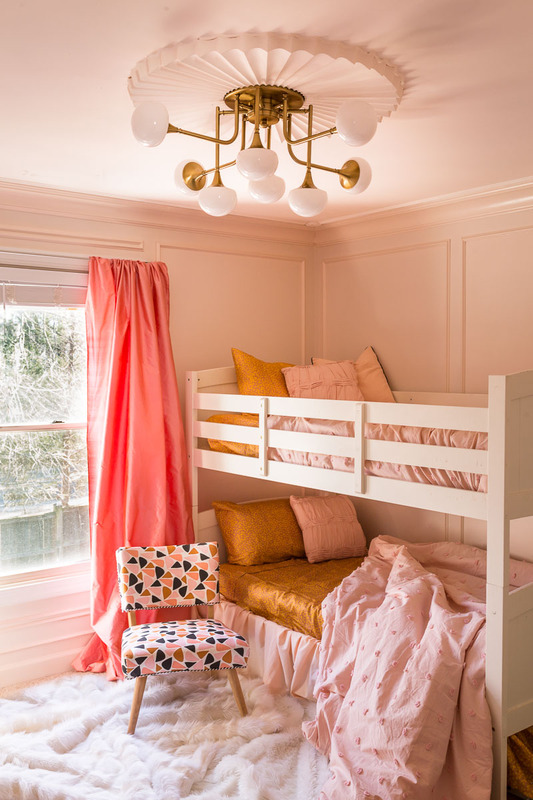 Love the colors and the chandelier! Wow the medallion is spectacular! Love this lighting and the look is coming together so wonderfully.